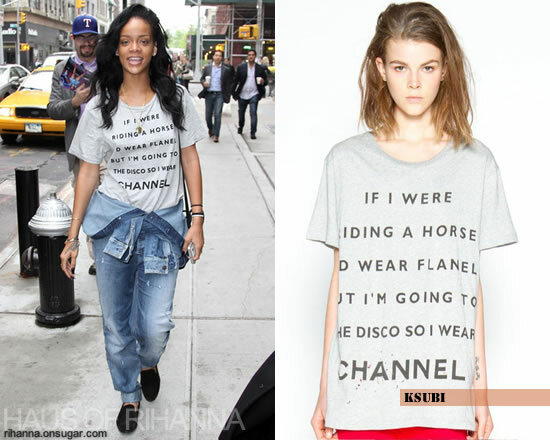 Yesterday Rihanna was spotted wearing ksubi’s Channel tee, which reads “If I Were Riding A Horse I’d Wear Flanel But I’m Going To The Disco So I Wear Channel”. She kept the look on trend for Spring by wearing black, suede moccasins. She wore her Rihanna for Armani Jeans jumpsuit in a very interesting way – with the top half tied around her waist to look like a jacket. She first wore the jumpsuit back in February. She finished the look with black suede moccasins which is very on trend for Spring.